Rick Bultez, C.H, is a successful radio personality who has been entertaining audiences for 18 years. He is a certified Hypnotherapist through the National Guild of Hypnotists. His spectacular display of mind power and antics can turn any skeptic into a fan. His stage shows are inventive, engaging as well as comedic. Rick tailors each show to the audience, making every show original and dynamic for all age groups. When Rick performs, the audience becomes the show! Using his wide-ranging experiences in the entertainment business, Rick is able to interact personally with the audience. In doing this, he is able to use the audience participation to create a one-of-a-kind show! 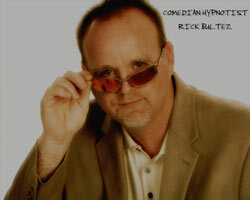 Rick Bultez, C.H, is an active member of the National Guild of Hypnotists in good standing. He runs a successful Hypnotherapy practice as well. Rick has created numerous Self-Help CD�s in his recording studio to help those who desire a positive change in their lives. Each CD features a full-length hypnotic session, and they range from Weight Loss to Stop Smoking. Rick Bultez, C.H, has traveled all over the country doing shows for all age groups as well as corporate and private functions.